Best Lemon Chicken Rice Soup Ever! Categories: Health Tips, Recipe, Uncategorized | Permalink. 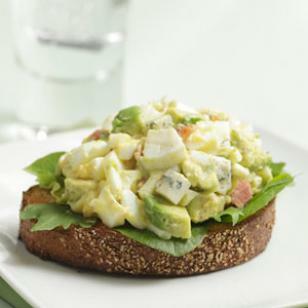 The bacon, blue cheese and avocado in this egg salad make it decadent. Serve it open-face on a piece of toasted whole-grain bread. Combine yogurt, mayonnaise, garlic powder, pepper and salt in a medium bowl. Add whites and the remaining 4 yolks to the bowl and mash to desired consistency. Gently stir in avocado, bacon and blue cheese. Serve open -face on a piece of toasted whole-grain bread or a bed of lettuce. Summer is just around the corner and soon the summer adventures will begin. Bring along a fun and healthy snack that your kids will love. Let them help you make it – this will allow them to choose their favorites and you know they’ll eat it. Make it fun and tasty – use the fruits and veggies they like most and use them to design a fun snack! 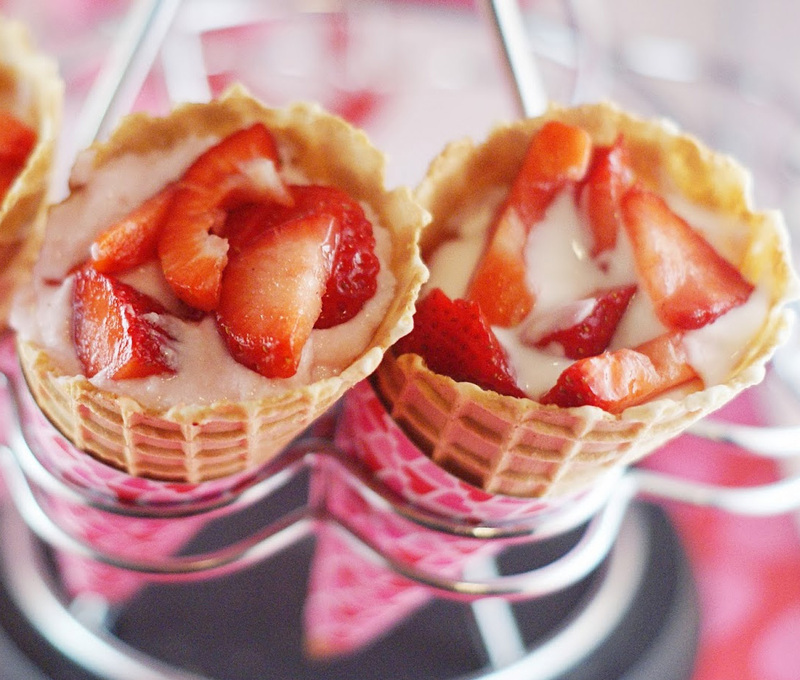 Fruit Cones – Let the kids fill waffle cones with the fruit they like inside, cover with saran wrap and pack in a cooler. This gives your little ones a fun snack that they’ll love! Or add a little light whip cream to the top and you’ve got yourself a healthy dessert option for the whole family! Mini Gold Fish Pizzas – Take a slice of bread and use a cookie cutter to cut the bread into a fish shape (or the shape of the cookie cutter) and make your own pizza! Bake at 350 for 10 minutes! This is a great opportunity to add some carrot red or orange peppers to make Nemo! 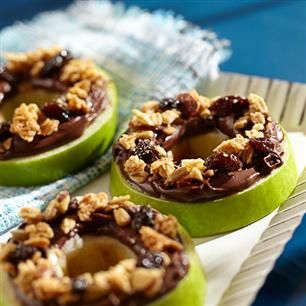 Chocolate Hazelnut Apple Rings – Slice your favorite apple and cut out the core leaving you with an apple ring. Here’s the best part – spread with Jif Chocolate Flavored Hazelnut Spread (or any spread your family enjoys) and top with granola. These go great with school lunches and are great summer snacks! Have an idea to share? Leave your favorite snack recipe in our comments section! Categories: Family Fun, Recipe | Permalink. Try this new way to enjoy turkey in this delicious chili recipe. It’s surprisingly light and flavorful. Click here to download a PDF of the recipe. In a medium nonstick saucepan, heat the oil over medium heat. Cook the onion and garlic for about 2 minutes, or until tender-crisp. Stir in the cumin, oregano, jalapeno, and red pepper flakes. Cook 1 minute, stirring constantly. Increase the heat to medium high. Stir in the turkey. Cook for 3 to 4 minutes, or until browned on the outside, stirring frequently. Stir in the remaining ingredients. Bring to a boil, still over medium-high heat. Reduce the heat and simmer, partially covered, for 30 minutes, or until the liquid has reduced by about one-third. For breakfast, lunch or dinner, this dish is well balanced and tasty. The ham and potatoes add great flavor and texture for a hearty meal. Click here to download a PDF of the recipe. Heat a 10-inch nonstick ovenproof skillet over medium heat. Remove from the heat and lightly spray with vegetable oil spray (being careful not to spray near a gas flame). Put the potatoes in the skillet. Lightly spray with vegetable oil spray. Cook for 4 to 5 minutes, or until golden brown, stirring occasionally. Meanwhile, rinse the broccoli in cold water drain but do not dry (some water droplets will cling to the broccoli). Put the broccoli in a microwave-safe bowl. Cook, covered, on 100 percent power (high) for 3 to 4 minutes, or until tender-crisp. Drain. Stir the broccoli into the potatoes. In a medium bow, whisk together the egg whites and egg substitute. Whisk in the ham, milk, and pepper. Pour the mixture over the potatoes and broccoli. Stir well. Bake, uncovered, for 15 to 18 minutes, or until the eggs are set (they don’t jiggle when gently shaken). To serve, cut the frittata into wedges. An italian classic with a fresh update. Serve with a garden salad on the side for a satisfying dinner. Click here to download a PDF of the recipe. 25.5 ounce jar fat-free, low sodium pasta or spaghetti sauce, such as roasted garlic or tomato-basil. In a large skillet, stir together the pasta sauce and red pepper flakes. Bring to a simmer over medium-high heat. Reduce the heat and simmer, uncovered, for 5 minutes, stirring occasionally. In a medium bowl, stir together the ricotta cheese and 2 tablespoons basil. In an 8 or 9 inch square baking pan, layer ¾ cup sauce, 2 noodles, half the ricotta mixture, half the mozzarella, ¾ cup sauce, 2 noodles, remaining ricotta mixture, and remaining sauce. Cover with aluminum foil. Bake for 40 minutes. Top with the remaining mozzarella. Bake, uncovered, for 15 minutes, or until bubbly. Let stand at room temperature for 5 minutes before cutting into 6 pieces. Here is a light version of a popular New England chowder. Cozy up to a bowl of this flavorful delight. Click here to download a PDF of the recipe. celery for 2 to 3 minutes, or until the onion is tender, stirring occasionally. Stir in the bacon bits. Cook for 1 minute, or until they are slightly rehydrated. Stir in the broth, undrained cream-style corn, whole kernel corn, ham, salt, and pepper. Increase the heat to medium high and bring to a simmer. Reduce the heat and simmer, covered, for 6 to 8 minutes, or until the flavors have blended, stirring occasionally. In a medium bowl, whisk together the half-and-half and flour. Whish into the corn mixture. Simmer, uncovered, for 3 to 4 minutes, or until the mixture has thickened and the flour doesn’t taste raw.